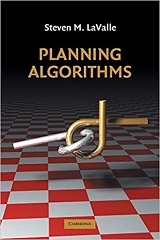 Planning algorithms are impacting technical disciplines and industries around the world, including robotics, computer-aided design, manufacturing, computer graphics, aerospace applications, drug design, and protein folding. Written for computer scientists and engineers with interests in artificial intelligence, robotics, or control theory, this is the only book on this topic that integrates literature from several fields into a coherent source for teaching and reference in applications including robotics, computational biology, computer graphics, manufacturing, aerospace applications and medicine. Difficult mathematical material is explained through hundreds of examples and illustrations. Steven M. LaValle is Associate Professor of Computer Science at the University of Illinois at Urbana-Champaign. He has worked in motion planning and robotics for over a decade and is a leading researcher who has published dozens of articles in the field. He is the main developer of the Rapidly-exploring Random Tree (RRT) algorithm, which has been used in numerous research labs and industrial products around the world. He has taught material on which the book is based at Stanford University, Iowa State University, the Tec de Monterrey, and the University of Illinois.